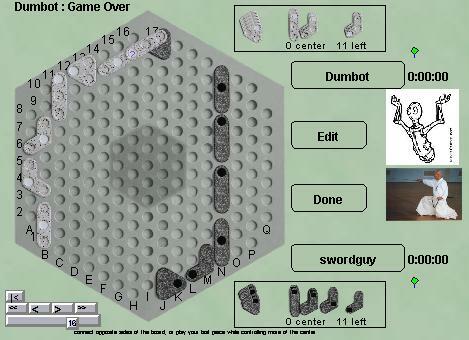 Pünct is a connection game which includes some 3D elements. The primary goal is to form a chain connecting two opposite edges of the board, but the rules allow the pieces to be placed, moved, or stacked in various ways. Pünct is probably the most brain-burning of the games at boardspace. Robots: the robots are good enough to win against beginners, but serious players will probably not be challenged. The back story: Punct was an experiment of sorts - I got advance information about the game before it was published, so I was ready with an online implementation virtually from day 1 when it was published.